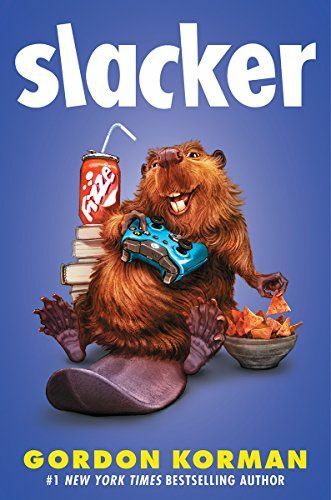 Slacker, a novel by Gordon Korman, a #1 New York Times best selling author, is about a kid named Cameron Boxer who is a gamer. Cam let his whole house burn around him because he didn’t take out the pasta like his mother ordered him to do. Because he was distracted in one game. His parents took away his game console and Cam can only earn it back if socializes in school. Each chapter is told through a different character’s viewpoint. There are several funny moments when Cameron forgets Mr. Fishaw’s name and calls him different names when he is talking to his friends. When he is talking to him he struggles and calls him “Sir”. Mr. Fishaw is the activities counselor. Everyone has a different lifestyle and Cameron Boxer knew from the start that he wanted to be a gamer. “Avoiding homework and socializing is Cameron’s goal so that he can play video games”. Then Cam’s parents threatened to take away his gaming console. Cam ends up starting a fake school club that makes it look like he is doing good deeds. Cam was the president of the fake club. Cam made some new friends and met some mighty enemies and comes across challenges along the way. (“If you like books with small graphics and interesting covers, you will want to read this book. The switching character can be difficult to comprehend but it is worth the effort because of added insight into each chapter. “Slacker” is a great book if you enjoy books that take some to be intrigued by.) Gordon Korman also wrote The Hypnotists and Ungifted two other excellent young adult novels. Gordon Korman is also well known for Schooled.